The Landmark Theater Corporation built the Lagoon Cinema in 1995 to be the “sister theater” to the Uptown, which it also owns. The Lagoon is linked to other theaters in the neighborhood in several ways. First, its name, “Lagoon,” was the original name of the Uptown Theater. 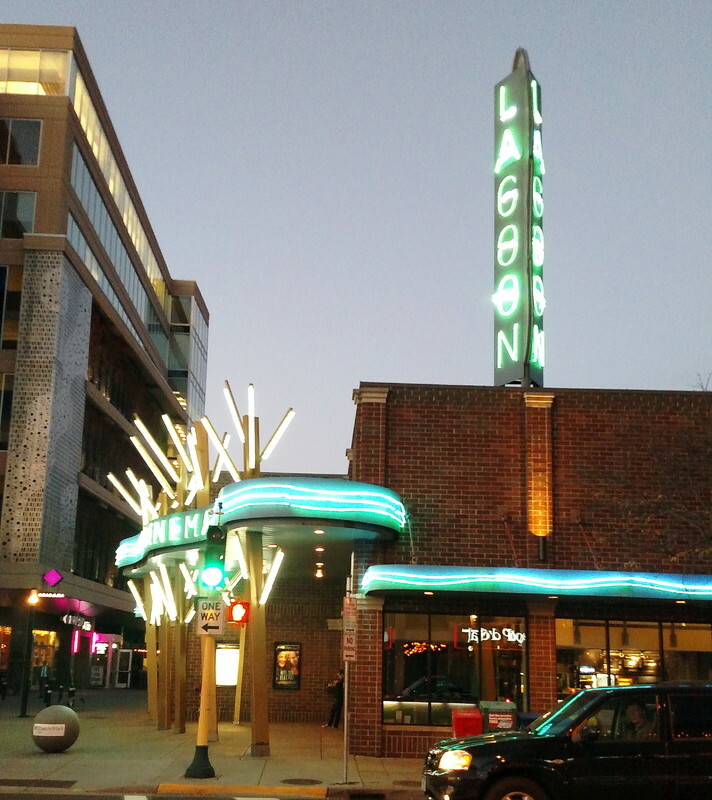 Also, the Lagoon’s exterior includes Neoclassical elements that recall the original style of the Uptown, other nearby theaters, and commercial buildings from the early 20th century. These Neoclassical elements in the Lagoon’s facade are the brick pilasters (as though a round column has been squashed flat against the wall) and the suggestion of dentils (from Latin dens -- “teeth”) in the top four rows of bricks. These elements of Neoclassical style, combined with the highly stylized neon “trees” and the curvy metal and neon marquee are typical expressions of Postmodernism, which is the theater’s overall design esthetic. Postmodern architecture began in the 1960s as a reaction against the seriousness and lack of ornamentation of Mid-century Modernism. The Lagoon’s roof-mounted blade sign is another reference to the Uptown. The Lagoon’s sign has the same triangular cross-section as the Uptown’s iconic tower, but the Lagoon tower continues the playful, curvy, seemingly light-weight feel of the marquee in contrast to the Uptown sign’s impression of solidity and great weight. 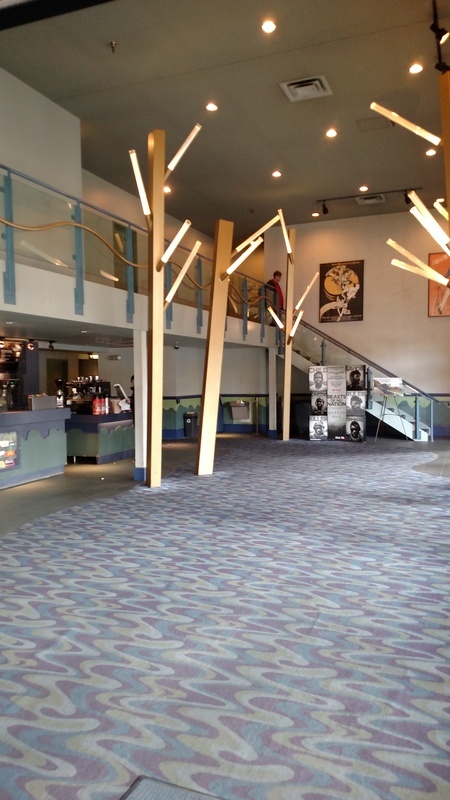 The Lagoon’s interior continues the Postmodern style with additional “trees” in the lobby and the individual theater auditoriums along with wavy-patterned carpeting that symbolizes the nearby Chain of Lakes. Abstract curved and geometric shapes on the lobby and auditorium walls further suggest the nearby lakes. These design choices give the feeling of an atmospheric movie theater with their suggestion of sitting amongst trees. 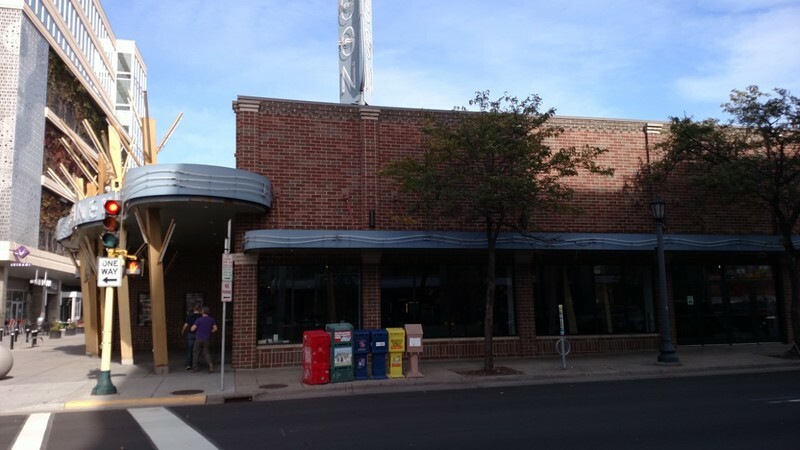 Though much newer than the other Uptown neighborhood theaters, the Landmark Lagoon Cinema was designed to link contextually with the other neighborhood theaters. 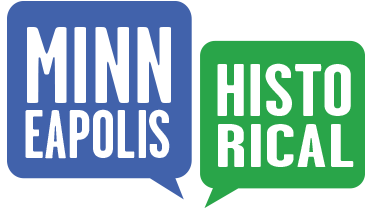 Edited by Richard L. Kronick, “New Lagoon Theater,” Minneapolis Historical, accessed April 22, 2019, http://minneapolishistorical.org/items/show/137.